When I started my new job at Experience UX I was sent two books to read. 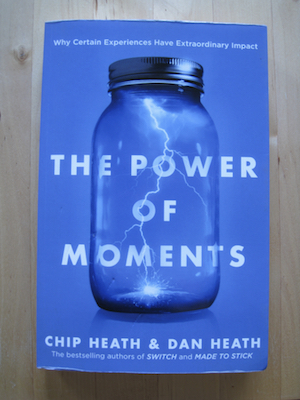 One was Made to Stick which I really enjoyed, the other was The Power of Moments by Chip and Dan Heath. It looked interesting but I was not really sure what it had to do with UX. Turns out it has lots to do with UX, but it is also relevant to managers, teachers, parents, care workers and anyone who is interested in improving their own and other people’s happiness. This is a book about how to create the peaks in peoples lives that help change them for the better. These are the moments people look back on as turning points. Either things that helped them change direction or learn something about themselves that helped them go forward. The book is full of examples of people who have done this and includes a plan to follow if you want to bring more moments into yours or others lives, great if you need to inspire a team, for instance. And the UX side of it? Well my job is to create positive moments for people using the things I design. If you do not understand how people end up having positive moments or peaks it is much harder to make sure you create them. This book makes it easy to understand what people are looking for as a positive moment and gives suggestions on how to achieve this. It is also an easy read full of fascinating human examples. If you are interested in people and what makes them tick, this is the perfect book for you. This is an easy quick read, but full of some powerful stuff. Are you brave enough to follow their instructions and create moments for the people around you or who use your designs?